Do you face trouble while transporting your scooter when you go out? Now you are free to move with your scooter with Sportaid’s huge assemblage of Wheelchair Ramps. Our principal objective is to enrich your life with glorious experiences by providing inexpensive top of the line equipment. To make your outings more enjoyable and trouble-free, we offer light-weight, easily portable Ramps from international brands. 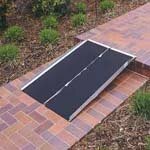 To make your movement smooth and effective, browse through our mass assortment of EZ-Access Wheelchair Ramps, PVI Wheelchair Ramps and TravelRamp Fiberglass Wheelchair Ramps below or feel free to call 1-800-743-7203 for expert assistance. Our experts can help your save up to 35% on Wheelchair Ramps! Find the Right Wheelchair Ramps for you! EZ-Access Wheelchair Ramps: - To make your outings more delightful, choose from our distinct variety of EZ-Access modular ramps. Sportaid offers a huge selection of EZ-Access ramps and platforms made of lightweight aluminum. To fulfill your accessibility needs, you can opt for the Suitcase Ramps or Trifold Wheelchair Ramps depending on your specific needs. Select from the top manufacturers and save big with Sportaid.com's everyday low prices. PVI Wheelchair Ramps: - Sportaid provides great options to match your requirements for ramps and carriers. 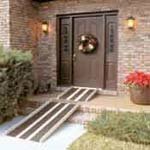 We offer architecturally crafted PVI Ramps with efficient designs. You can choose from Bariatric Ramps, Multifold Wheelchair Ramps, Solid Wheelchair Ramps and Threshold Ramps as per your requirements. Our proficient team will help you in choosing the right kind of ramps for the added convenience while going out with your family and friends. TravelRamp Fiberglass Wheelchair Ramps: - TravelRamp Fiberglass Wheelchair Ramps make your home or office more accessible to wheelchairs, scooters, and power chairs. Additionally, these lightweight wheelchair ramps are also excellent for those using walkers, canes, or crutches. Whether you are a new customer or someone who has been with us for a while, we guarantee satisfaction. After over 25 years in the business helping people find the appropriate Wheelchair Ramps at the lowest prices, we continue to lead the industry! We are capable of beating any competitor's advertised price, just call! Our customer service staff has over 50 years of experience, plus over 90 years of combined wheelchair use experience. We look forward to working with you!